Patrick Racing was opened in 1984 by Nigel Patrick. Nigel has vast experience and knowledge from his extensive racing career. Nigel raced motorcycles for over twenty years in many different disciplines, Roadracing and later Drag Racing. He is one of the few riders who won national championships in all three professional Drag Racing categories. Throughout his racing career Nigel built his own engines and became know worldwide as a "cylinder head guy". When the company opened it mainly specialized in racing engines and NHRA Pro stock, in particular building 200 HP plus in-line fours. Timing is everything in life and 1984 saw the launch of the Evolution engine by the Harley Davidson Factory. In the next few years Patrick Racing became more involved in modifying the stock HD engine. In 1989 Nigel designed the first production Billet Head for the Evolution engine. PR was also one of the first companies to fully CNC port a cylinder head using multiple axis CNC mills. In 1991 Patrick Racing was making complete billet engines, many of which have been featured on television and have been used by most high end bike builders. PR motors have been featured in many winning custom show bikes and numerous dyno shoot outs all over the world. It has been the goal of our company to stay at the forefront of technology and over the years we have always acquired the latest state of the art equipment to be able to produce the finest products available in the market place. We have in house vertical and horizontal multi axes CNC mills, state of the art valve seat machines by Serdi and a single point Newen system, computerized dyno and crank balance machines. In 2001 Patrick Racing took on the AMA Prostar Hot Rod Cruiser class, racing the Yamaha Warrior. In the next five years PR won five straight championships and set twenty eight records along the way. Patrick Racing is located in the heart of Orange County, California. Individual and group tours are always available by appointment. The new Patrick Racing facility. 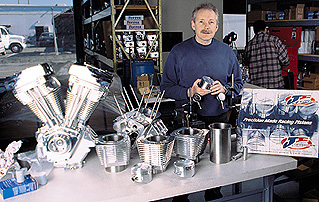 Nigel Patrick with just a few of the billet parts they manufacture. 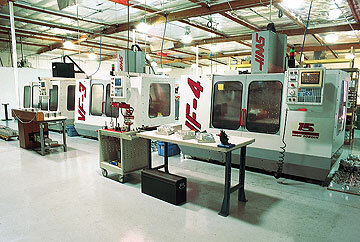 Three of company's CNC machines. These American made CNC's run only the highest grade American made raw materials.